100% koji miso, made with plenty of rice-malt and domestically produced soybeans. Each container is 1kg and arrives frozen. Miso is made made from fermented soybeans and a few other ingredients, and can be used to make soups and sauces. Our koshi miso is matured for about 4 to 8 months, making it especially fragrant and giving it a gentle texture; with less sharp saltiness to its flavor. Maturation periods vary depending on the region. This is a long-maturation red miso with good fragrance and color. 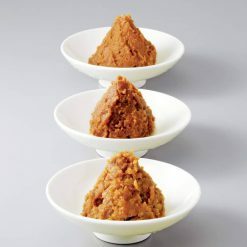 Koji ratio: 100% (The koji ratio of the miso is the ratio of soybeans to koji in the ingredients. The koji ratio = the weight of koji materials used ÷ the weight of soybeans used × 10). The higher the koji ratio, the sweeter the product tends to be. Koji is a type of mold that can used in many different kinds of fermented foods, including rice vinegar, soy sauce, and miso. 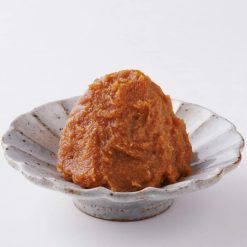 Miso in paste form is extremely strong, and can be heavily diluted and turned into soups and sauces. For example, only a few spoonfuls of miso are required to make several helpings of miso soup.To make miso soup, first make a soup broth, then mix the miso into the hot broth until it has completely dissolved. There are many different ingredients that can be added to miso soup, but the most common are strips of seaweed and tiny cubes of soft tofu. Miso soup is a great option for a quick-to-make (and healthy!) appetizer. 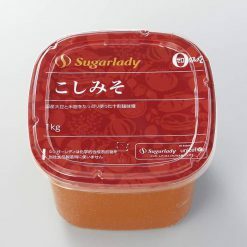 This product contains soybeans (domestic), rice (domestic), table salt, ethyl alcohol..